As we enter a summer of international football, with the world’s best battling it out for the World Cup, at Spielverlagerung we will be covering all the action slightly differently from previous tournaments. Like we have done before with Champions League qualifiers, we will be posting a recap of each day’s action, featuring all of the games played. We will pick a feature match from each day’s action and complement it with concise reports of the other group games. Russia kicked off the 2018 World Cup against Saudi Arabia in the newly renovated Luzhniki Stadium in Moscow. Though some aspects of the hosts’ game were similarly updated, most remained predictably untouched, while Juan Antonio Pizzi’s Saudi Arabia continue to play attractive, if not particularly effective, football. Starting line-up. Dzagoev’s injury saw him replaced by Cheryshev who moved to the left wing. Golovin adeptly played behind Smolov. Russia manager Stanislav Cherchesov has been widely expected to play with some form of back three/five system, having favoured either a 5-4-1 or the 5-3-2 – widespread in Russian domestic football recently – in almost all his games in charge. That Sbornaya moved to a back four in their final friendlies only two weeks prior to their tournament opener came therefore as a surprise. Within Russia’s 4-2-3-1, however, their general approach remained – provoked somewhat by the Saudis. With the guests pressing up on the first line of the hosts’ build-up play in their 4-1-4-1/4-3-2-1, Salman Al-Faraj joining Mohammed Al-Sahlawi in pressuring Russia’s central defensive pair in Ilya Kupetov and Sergey Ignashevich, Cherchesov’s men bypassed this quite happily. What resulted was a very low risk build-up game focused on direct balls to the flanks for advanced fullbacks, particularly with Mario Fernandes on the right, with the naturalised Brazilian right back performing a similar function as he does for CSKA Moscow. Furthermore, since Fernandes made these moves to the last line so early in organised possession, he himself dictated how his centre backs could bring the ball forwards. 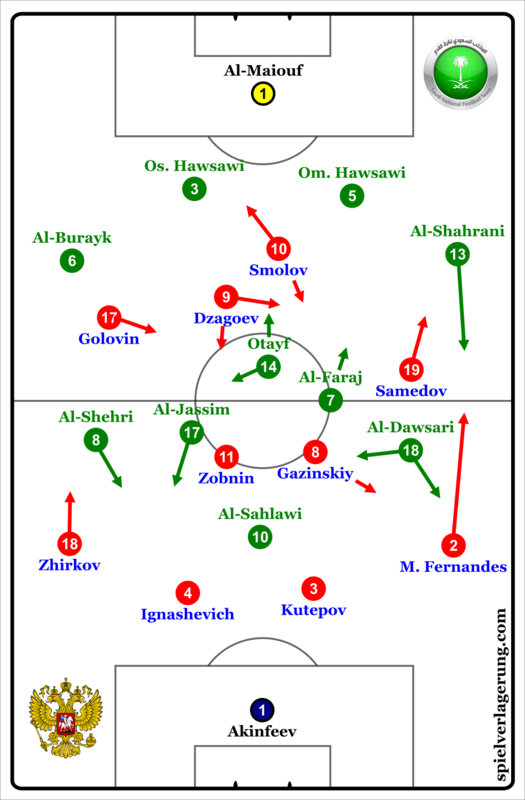 Apart from the occasional outwards tilting of the two sixes, Roman Zobnin and Yuri Gazinskiy, next to the central defenders, there was no way for Sbornaya to play around the pressing of Saudi Arabia’s situational front two, or indeed bridge the large distance between their back line and the rest of the team. Even if Saudi Arabia do not win any points in Russia this summer, they will no doubt win the hearts of many neutrals as a result of their style under Juan Antonio Pizzi. The former Chile manager has the Green Falcons playing a possession-focused style, with clear signs of above-average organisation both with and without the ball. Their commitment to controlling possession with one of the weaker squads in the tournament is admirable, and made possible by their organisation. The central defenders, Omar and Osama Hawsawi, drop very deep to increase the distance between them and the Russian front line – thus giving them more time on the ball and making them more difficult to press. Additionally, the inward movements of the Saudi wide players, Salem Al-Dawsari and Yahia Al-Shehri, behind the Russian midfield served to provide Saudi Arabia with a potential route to attack the hosts’ box. Indeed, it was in those moments when Al-Dawsari moved behind Gazinskiy in the left halfspace, combined with the adventurous left back Yasir Al-Shahrani’s thrusts forward and served by the deeper positioning of Al-Faraj on the left side, that the visitors looked at their most dangerous – with intricate dribbles and sharp combination play teetering on the edge of threatening to break through. Ultimately, however, it was merely that – a mostly empty threat. While the Saudi players showed some degree of technical ability, especially in combinations and tight dribbling from their attacking players, the spacing in midfield made it difficult to bring the ball to them in good condition. The midfield spacing enabled these tight combinations, whilst also restricting their possibilities to progress. Tilting heavily towards the ball-side, they looked to create small overloads, particularly in the halfspaces and near the flanks. While this allowed them to keep the ball for a short period under intense Russian pressure, it was not as effective for progressing the attack and moving the ball to other areas. For this, the central midfielders were often not able to find the passing lane to escape the current space, or they were not able to support quickly enough once the ball got there. As such, these situations highlighted one of the fundamental flaws in Saudi Arabia’s game in their lack of coordination in possession. Without physically dominant attackers, they need to rely heavily on giving the ball-carrier time on the ball through manipulating the opposition’s defensive behaviours. Playing to a winger surrounded by four opponents with no route to pass away does not suit them, yet was a fairly common outcome. Moreover, as the Saudi midfield tilted more heavily towards the ball, their ability to control counter attacks was dramatically reduced. Along with Al-Shahrani pushing up consistently on the left, and the remaining defenders acting particularly passively in pressuring the player on the ball, Russia often had large spaces down the flanks to counter attack into. Further still, with little fluency in the covering actions of the defensive line, spaces were opened in more central positions once the attack was in place, as seen in the 2-0 goal. That Saudi Arabia failed to muster many attacks of note could be attributed to the level of their players, though Russia’s defensive organisation should be noted too. A compact and well-coordinated 4-4-2 when in their deep block with intense shifting made it difficult for the guests to find spaces to break through. Defending in higher areas, the 4-4-2 shape sometimes became an asymmetric 4-3-3, as Aleksandr Samedov pushed up onto Omar Hawsawi, with the front two of Alan Dzagoev and Fedor Smolov maintaining access to the other two players in Saudi’s deep build-up. From here, Zobnin and Gazinskiy would also occasionally join in in pressing the opposition in their own half. While this gave the Russians some success, with Saudi Arabia not being able to often control their build-up, it exposed one of their greatest weaknesses. Particularly in moments when Mario Fernandes jumped up in pressing to gain access to the fullback or a deep-moving winger, the spaces on either side of Ignashevich and Kupetov could easily have been exploited. That Sergei Ignashevich was referred to as being ‘wooden’ even ten years ago should illustrate the type of problem Russia might face against Salah, Suarez, and Cavani in their next games. Despite this glaring weakness, and an uninspiring possession game, the hosts ran to comfortable 5-0 winners. With what is one of the weakest Russian national team squads in recent memory, they are perhaps fortunate to have kicked off their own World Cup against an even weaker opponent. That being said, Russia’s approach preyed almost perfectly on the deficiencies of an idealistic Saudi Arabi side – forcing their weakest players on the ball consistently, leading to a number of cheap turnovers. The Saudis were largely unable to exploit the large spaces behind the Russian midfield forced open by the dropping central defenders, but the hosts should not be surprised if the other two teams in their group can. As for Saudi Arabia, the number and nature of their individual and collective errors were simply too great to cause an upset in the opening game. The 5-0 scoreline perhaps flattered the the Russians, but will serve as a stark reminder for the Green Falcons of the fine margins between success and failure in the risky style they play. If Pizzi’s team can address their midfield spacing issues, however, particularly in their deep build-up, they will not only continue to entertain, but stand a better chance of achieving a shock result in their next two games.